This composite image shows a coronal mass ejection — a huge eruption of solar plasma — as seen from two space-based solar observatories and one ground-based instrument. 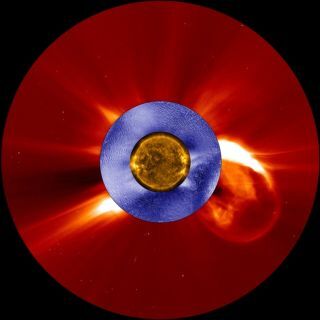 The image in gold is from NASA’s Solar Dynamics Observatory spacecraft; the image in red is from the ESA/NASA Solar and Heliospheric Observatory; and the image in blue is from the Manua Loa Solar Observatory’s K-Cor coronagraph. NASA scientists have developed a new technique that could improve space-weather forecasts and help protect astronauts from potentially dangerous solar storms. Earth's sun is an active star that repeatedly unleashes powerful flares and huge eruptions of solar plasma known as coronal mass ejections (CMEs). These dramatic events can send fast-moving solar energetic particles, or SEPs, streaming toward Earth. While the planet's magnetic field and atmosphere serve as a protective shield, astronauts in low-Earth orbit are potentially susceptible to the harmful effects of such solar outbursts. Most of the current space-weather research uses space-based coronagraphs. The new technique, by contrast, employs ground-based coronagraphs, which can deliver observations "almost instantly, and at a much higher time resolution than satellite instruments," NASA officials said. "With space-based coronagraphs, we get images back every 20-30 minutes," Chris St. Cyr, a space scientist at NASA's Goddard Space Flight Center in Greenbelt, Maryland, said in the statement. "You'll see the CME in one frame, and by the time you get the next frame — which contains the information we need to tell how fast it's moving — the energetic particles have already arrived [at Earth]." This GIF shows a CME as seen by two space-based solar observatories and one ground-based instrument. The image in gold is from NASA’s Solar Dynamics Observatory spacecraft; the image in red is from the ESA/NASA Solar and Heliospheric Observatory; and the image in blue is from the Manua Loa Solar Observatory’s K-Cor coronagraph. Solar particles released during a CME are extremely energetic and can move at nearly the speed of light. For the recent study, scientists used observations from the ground-based coronagraph called K-Cor, which is part of NCAR's High Altitude Observatory and resides atop Hawaii's Mauna Loa volcano. The researchers' findings, published Jan. 30 in the journal Space Weather, confirmed that SEPs could be detected as early as 45 minutes before the particles arrive at Earth (or tens of minutes before the particles even leave the sun's inner atmosphere). And the scientists said they hope to improve this early warning system even further. "Currently, processed images from K-Cor are available on the internet in less than 15 minutes after they're taken," Joan Burkepile, a study co-author based at NCAR and principal investigator for the K-Cor instrument, said in the statement from NASA. "We're installing a more powerful computer at the observatory in Hawaii to process the images seconds after they are acquired, and provide the data on the internet within a minute or two of acquisition."